Learn all about the new tax law that allows businesses to deduct the costs of fire protection systems. The recent tax law has been a massive issue in the news, but its complexity makes it hard for people to understand how the tax reform with impact them personally. Small and medium-sized businesses should know that the revision of the IRS tax code Section 179 is especially important, as fire protection systems are now considered qualifying expenses. Continue reading to learn more about Section 179 and what it means for your business. Section 179 permitted business to deduct up to $500,000 in qualified expenses for a given year to incentivize businesses to invest in themselves, which in turn increases revenue for other companies. 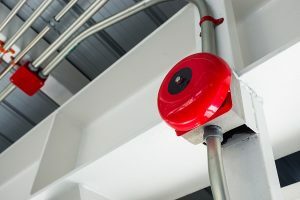 The new reform to Section 179 changed to now include all fire protection systems, including fire alarms and security systems, as qualifying expenses. This gives businesses a great incentive to upgrade their fire and security systems to improve the security of their building and keep their occupants safe. The reform is especially significant for small to medium-sized businesses as the new bill raised the deduction from $500,000 to $1 million- but only for businesses who spend no more than $2.5 million on qualifying purchases. This allows smaller businesses to make the much-needed fire and security upgrades that were likely too expensive to make on their own. Large businesses that spend over $3.5 million on qualifying equipment will not qualify for the deduction. If your business needs an upgraded fire protection system or security systems, now is the best time to take advantage of the tax reform! Purchase or finance the new system for your business, and you can deduct the entire purchase from your 2018 gross income as long as you fully purchase/finance the system and put it into operation before the end of the year. For those who have been meaning to upgrade their systems but were waiting for the right time to undergo changes, 2018 is the best time to take advantage of the opportunity. Whether you need smoke detectors, fire extinguishers, or an automatic sprinkler system installed at your rental property, Fireline has you covered. We have been protecting people and properties from fire damage since 1947—and our experience shows in our excellent work! We are known for our wonderful customer service, our expertise, and our reliability. For more information on how we can help your residential or commercial property, visit us online or give us a call at (800) 553-3405. For more fire safety tips, be sure to follow us on Facebook, Twitter, LinkedIn, and Google+. This entry was posted on Wednesday, March 21st, 2018 at 3:59 pm. Both comments and pings are currently closed.